So who knew that John La Farge (an artist I am familiar with from his stained glass windows at Boston’s Trinity Church and some lovely paintings at the Museum of Fine Arts, Boston) traveled to the South Seas before Gauguin? Not I until my friend called me to go on a road trip last weekend to see the show at the Yale University Art Gallery. The exhibit includes sketches and a few paintings, but the stand outs of the small show are his vibrant watercolors. 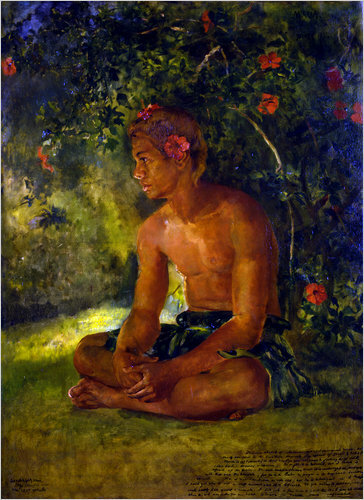 These works are much more ethnographic than the paintings of Gauguin, who of course had an entirely different aesthetic, and La Farge seemed to me to present a truer vision of life on the islands of Samoa, Tahiti and Fiji. La Farge’s naturalistic technique was used to illustrate not only ritual dances, but every day tasks and children at play as well. On a cold and dark January afternoon, the beauty of the watercolors provided a stunning contrast. The show has closed in New Haven, but is traveling to the Addison Gallery of American Art and will open on January 22, 2011.